Happy Bloggers Challenge Friday! Thanks to those who played along with the Color Challenge! The challenge this week is Dog Days of Summer (open to your interpretation)! Dog Days of Summer has me going to the beach to cool off! All stamps are from Our Daily Bread Designs. I created a version of the "tent fold" card for my scene. 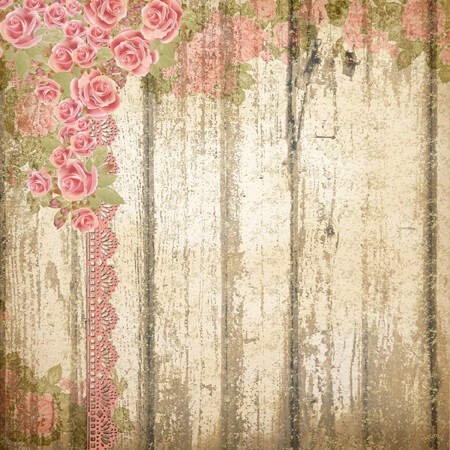 All images are stamped on the following piece of pattern paper from the ODBD Blushing Rose Paper Collection. As I thought it made for a good beach look without having to add a lot of coloring to my scene. The image from The Mighty Sea is stamped on the back panel and colored with STAEDTLER Karat Aquarell Watercolor Pencils. 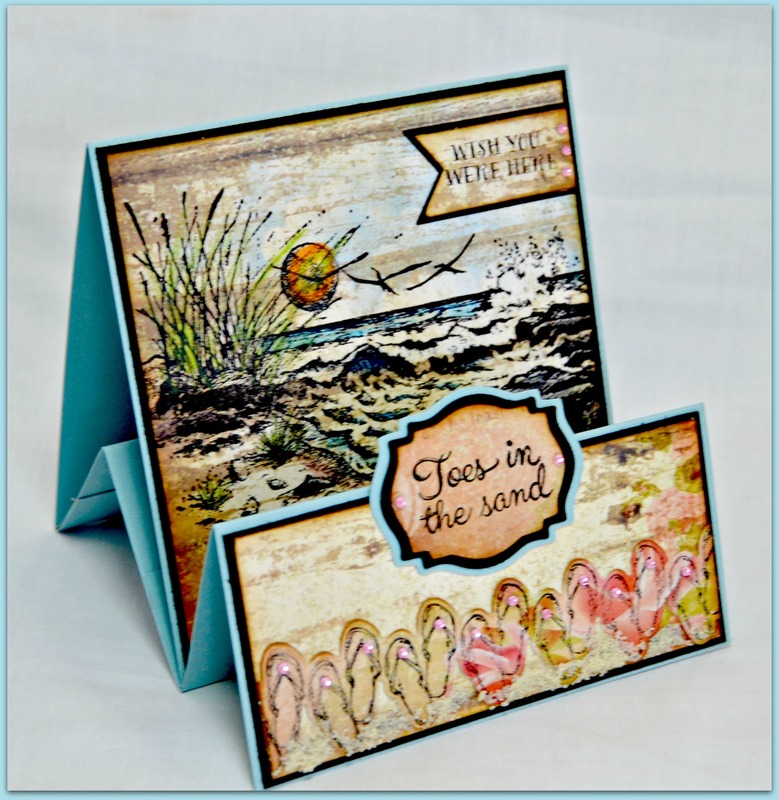 The sentiment from Flip Flop Fun is stamped on a scrap piece, then die cut using the ODBD Custom Pennants Die and trimmed to fit the same panel that was die cut from Black card stock. The Flip Flops from Life is Better were stamped in Black on the same paper then die cut using the ODBD Custom Flip Flip Flop Border Die. 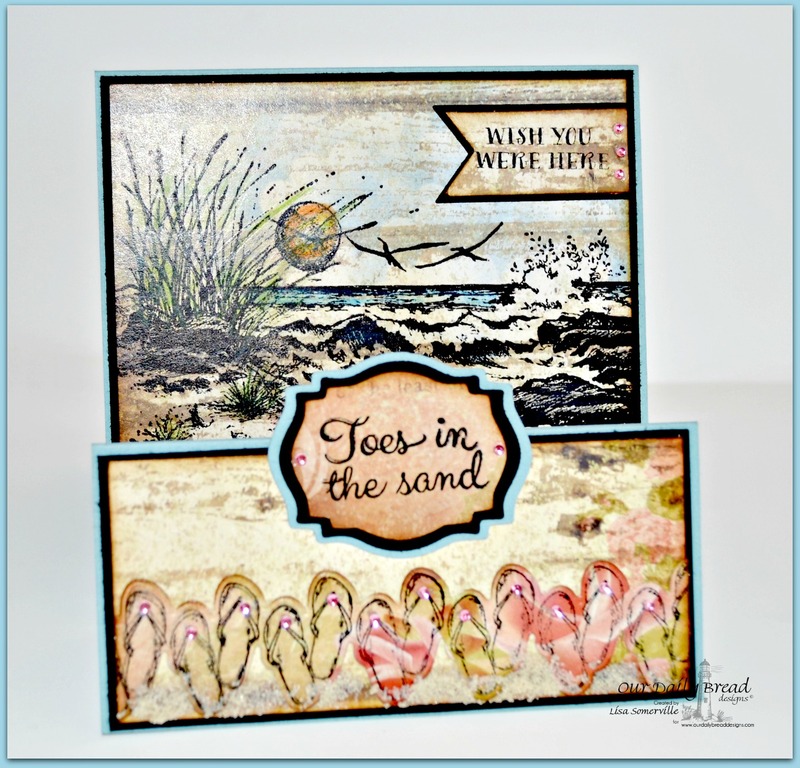 Once adhered to the card, I added MuddPuddles sand. 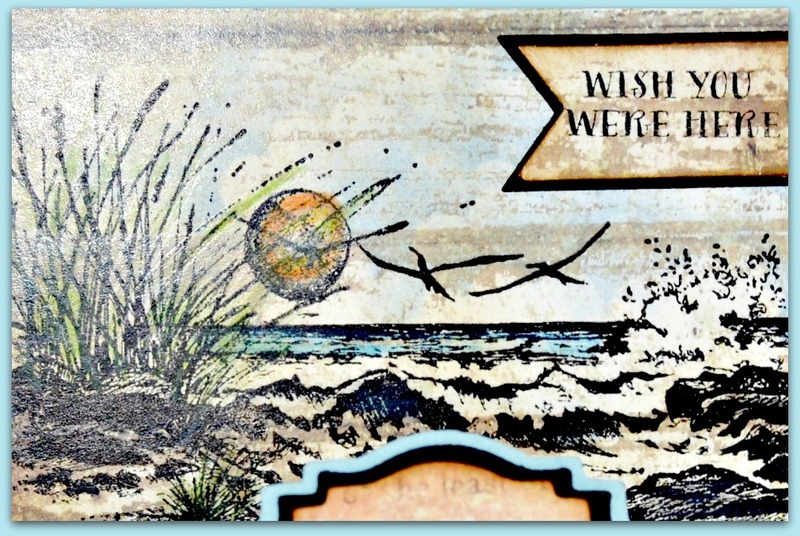 The sentiment is from Flip Flop Fun stamped on a scrap of the pattern paper collection. I die cut the Black panel using Spellbinders Labels 18, then imported the shape into my Silhouette so that I could die cut the stamped panel and the Blue layered panel. To further embellish I added Zva Creative crystal gems to the flip flops and stamped panels. Love those flipflops in front of this FABBY scene! Terrific use of color. Really cool folds!! Fab beach scene...like the coloring. Love the look of this fancy fold! The line of flip flops looks great in front of the beach scene. I could not let this challenge theme go and not use that stamp! Lisa, your card is gorgeous and what a great fancy fold! Love it!